Gold was discovered in the late 1850s in the Cariboo Region of British Columbia’s southern interior, stretching from Cache Creek in the south to Quesnel in the north. When the first discovery was announced, people flocked to the area to stake their claims. Before the torrent of excited miners arrived, British Columbia’s total population was 7,000 people. By July of 1859, approximately 33,000 miners had arrived in the area, eager to take home their portion of the profits. Searching for a better life, a large group of Canadians left their Ontario homes to strike it rich in British Columbia’s gold fields. This group of 150* men, one woman (Mrs. August Schubert**) and her three children travelled for months across Canada until they reached Fort Edmonton (now Edmonton, Alberta) in 1862. Here, they restocked their supplies and prepared for the arduous journey across the Rocky Mountains. 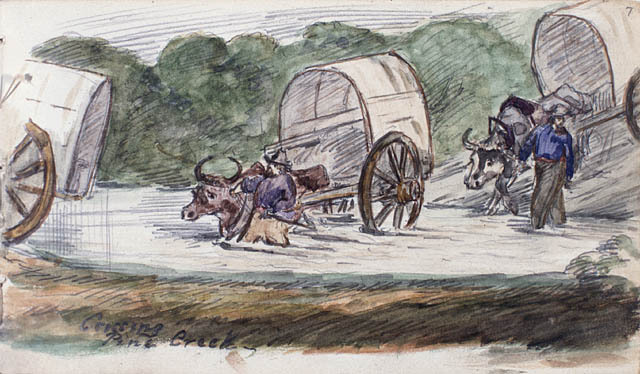 The Overlanders travelled as far as they could with carts, oxen and horses carrying their supplies, but by Lac St. Anne, they had to abandon the last of their carts and continue onward carrying their supplies in heavy packs. The large group was soon spread thinly across 300 kilometres (186 miles) of the western prairies. After the lead group of Overlanders crossed Yellowhead Pass, they camped at Cow Dung Lake, now known as Yellowhead Lake. This group was fighting starvation and while a few hunters in the group brought back squirrels and small birds, the group had to sacrifice some oxen and horses for the meat. Forging on with supplies of meat dried from their pack animals, this first group of Overlanders reached the Shuswap salmon-fishing camp at Tête Jaune Cache on August 27th. Here they traded much of their remaining ammunition, clothing, needles and thread, for much needed sustenance: salmon, huckleberries, saskatoons (berries) and pemmican. On September 7, a second party of Overlanders passed Yellowhead Lake. Pausing there as well to replenish their supplies, they became trapped on an island by rapidly rising floodwaters. When the final group of Overlanders reached them, a few days later, the stranded party was nearing starvation. With the help of the new arrivals, everyone managed to get off the island and continue their trek. The final group of travellers reached Tête Jaune Cache on September 16. From Tête Jaune Cache, the group divided again, choosing to take different routes to the lucrative Cariboo gold fields. The larger group decided to take the Fraser River to Fort George and then head south to Quesnel. They made canoes for their trip from hollowed-out cottonwood logs and ox hides and travelled down the first stretch of the Fraser quite easily. When they reached the Grand Canyon of the Fraser, a short gorge about 30 kilometres (18 miles) upstream from the confluence of the Bowron River, disaster struck. 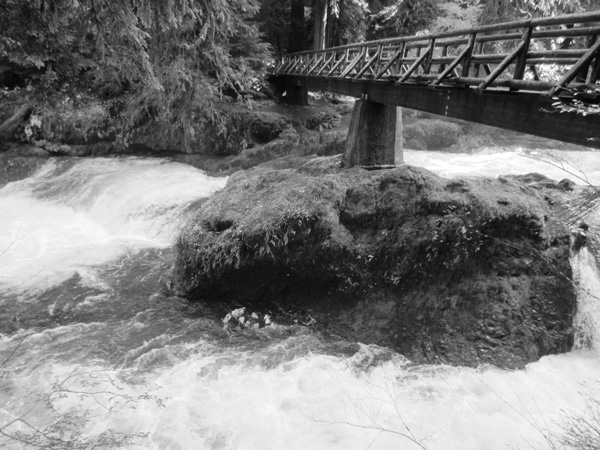 Caught in the tumultuous Scow Rapids, canoes were overturned and torn apart. Four men died from drowning or hypothermia and many supplies were lost. Worn down and badly beaten by the day’s events, the group pressed on, reaching Fort George on October 8. A smaller group of Overlanders left Tête Jaune Cache and travelled overland up the McLennan River, which flows north into the Fraser River. Thinking they could make the trek to the gold fields by land, they purchased over 100 head of cattle and horses. Soon, the travellers discovered they would be forced to take the Thompson downriver to reach their destination. In preparation, they slaughtered their cattle and turned their horses loose. They constructed rafts and began their journey down the Thompson River to Fort Kamloops. This second group ran into trouble in the Murchison rapids and Hells Gate where two men died. The rest of the group arrived in Fort Kamloops in October of 1862. 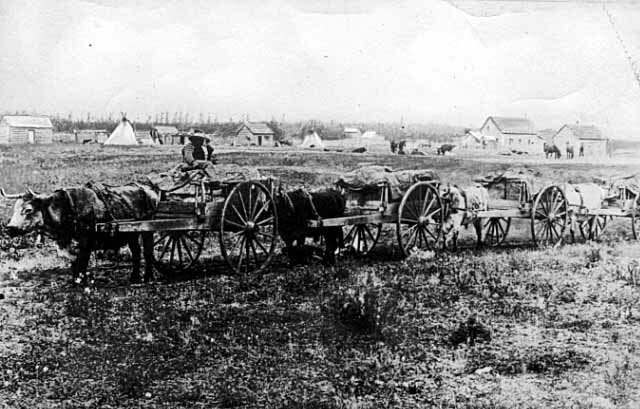 While both groups suffered great losses, the majority of the travellers survived the epic journey and went on to take part in the Cariboo Gold Rush. The hardships they experienced and the perils they encountered, especially between Jasper and Tête Jaune Cache and in the canyons and rapids of the Fraser and North Thompson rivers, make their journey one of the most impressive events in Canadian travel history. *This number varies from 150 – 200+. **Mrs. Schubert gave birth to her fourth child the day after their arrival at Fort Kamloops. Thank you for dropping by. I update this page fairly frequently, so why not become a follower? That way you will be the first to know what interesting bit of history I have dug up for you. Thanks.